The DOR released this as part of their “Revenue Update” for the month. 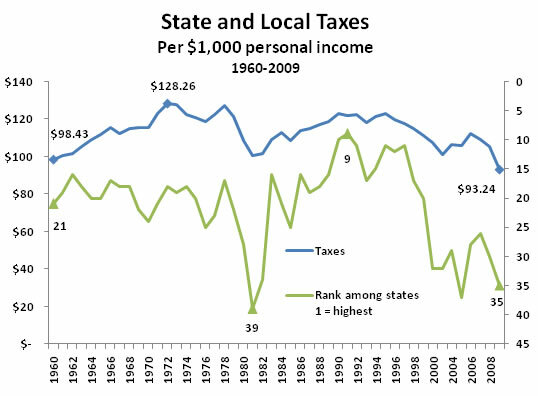 Washington’s state and local taxes (as a percent of personal income) dropped to their lowest level in 50 years in Fiscal Year 2009, according to new figures released by the U.S. Census Bureau. Washington taxes dropped to $93.24 per $1,000 personal income from $105.49 in Fiscal Year 2008. While many states experienced declines in taxes relative to personal income during that period, Washington’s decline was steep enough to change its national ranking to 35th highest among the states in 2009 from 30th highest in 2008. The national average for Fiscal Year 2009 was $102.10, down from $111.99 the prior year. The $93.24 figure, comprising $56.70 in state taxes and $36.54 in local taxes, is the lowest since the Department of Revenue began tracking this statistic in 1960, when the rate was the second lowest at $98.43. Taxes per capita also declined to $4,049 in 2009 from $4,354 in 2008, dropping Washington’s per capita ranking nationally to 21st lowest from 16th. The national average in 2009 was $4,141. More information on changes in rankings over the years and the factors involved is available in Comparative State and Local Taxes 2009, published online at http://dor.wa.gov/Content/AboutUs/StatisticsAndReports/2009/Compare09/default.aspx.